(Natural News) Vitamin C (ascorbic acid) is a powerful nutrient that can boost your immune system and improve your overall health. According to Derek Henry, Healing the Body’s founder and creator of the THRIVE Online Health Program, camu camu (Myrciaria dubia) is one of the most potent sources of vitamin C.
In the video below, which was uploaded on the official Healing the Body Brighteon channel, Henry talks about this “power fruit” and how an organic source of camu camu can strengthen your immune system, especially during flu season. Vitamin C is a must-have for health enthusiasts, especially in months where your immune system is challenged, such as the transition from summer to fall, fall to winter, or winter to spring. You can get vitamin C from different sources such as intravenous injections, supplements, and whole foods. However, like any addition to your daily habits, potency and sustainability are important. A weak source or vitamin C or something that’s inconvenient to get will be more of a nuisance than a healthy addition to your daily routine. 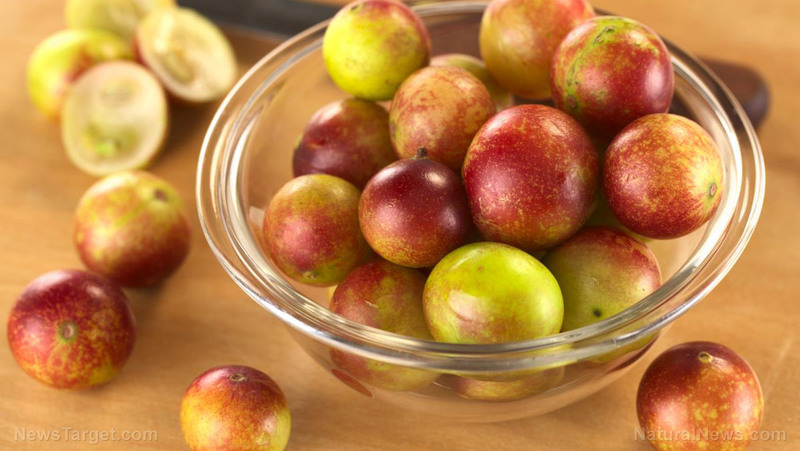 Thankfully, camu camu is one of the most concentrated sources of whole food vitamin C. You can easily add it to your routine on a daily basis to boost your health. Camu camu is also called cacari or camocamo. The plant produces small drupes that are similar to cherries, and camu camu is grown deep in the heart of the Amazon rainforest of South America. A 100-gram serving of camu camu has at least 7.5 g of vitamin C, an “unprecedented 7.5 percent of its weight.” In comparison, 100 g of camu camu has 60 times more vitamin C than an orange, at least on an ounce to ounce basis. Vitamin C is one of the most potent antioxidants, and camu camu is thought to be one of the most powerful whole food sources of the vitamin. Imagine the free radical scavenging effects of this amazing power fruit and how it can help boost your overall health! It can improve the aging process. It enhances mood and improves cognitive balance. It promotes a healthy nervous and reproductive system. It promotes eye, gum, heart, and liver health. It supports healthy collagen, ligaments, and tendons. It supports the healthy function of the immune system. Take camu camu supplements during seasons when fatigue and sickness are prevalent so you can stay strong and healthy. Camu camu’s synergistic blend of nutrients and high vitamin C content can do a lot to improve your well-being. You can’t accomplish the same thing by only taking ascorbic acid supplements alone, and the effects won’t be as prevalent. The source of your camu camu is an important thing to consider. When you take a pure, potent, and fresh source of camu camu, you may even feel it take effect moments after ingestion. View the full video about this power fruit, which you can watch at this link. Browse more articles about other vitamin C-rich foods like camu camu at Superfoods.news.